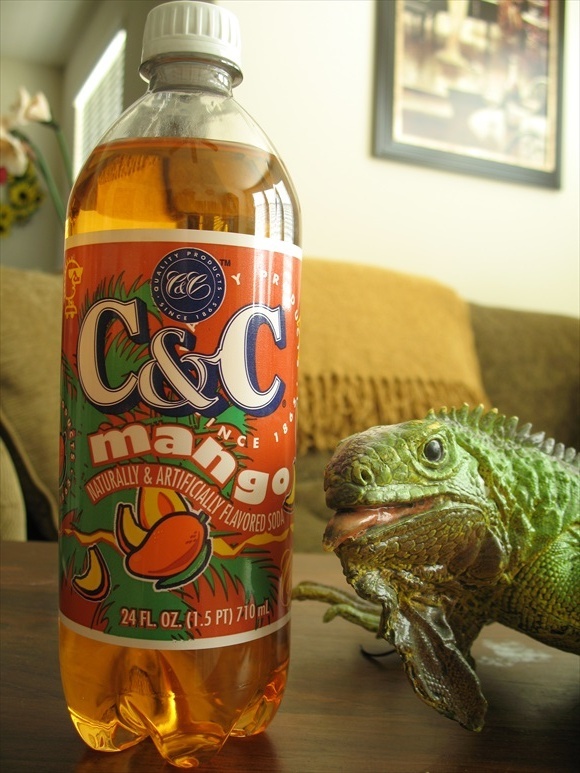 I’m happy to say that the next entry in the C&C collection is a flavor that rarely greets us in soda form, mango. C&C Mango has a delightful orange (with a hint of pink) color and several slices of cartoon mango on the label. Like the rest of the C&C collection it’s sweetened with HFCS and chock full of chemicals. Oddly enough I have no amusing antidotes about mango, so I guess I’ll just be on my way. A very rich and velvety mango scent welcomes my nose to its home. It reminds me of cutting open a juicy mango and inhaling the delicious aroma it produces. So far C&C Mango seems to be exceeding the expectations I have set for it. Hopefully this trend continues in the taste portion. Why aren’t there more mango flavored sodas? C&C Mango’s flavor does not disappoint as it matches the rich and flavorful scent blow for blow. While I wouldn’t quite equate it with drinking mango juice the powerful taste of mango permeates all possible spaces within my mouth. Unfortunately the HFCS gums up the works a bit though as the syrupy coating sits in my mouth like a hot dog on a cool floor. The carbonation is fairly low which allows the mouth-feel of C&C Mango to be smooth and enjoyable; although I feel that the bubbles could be a bit more plentiful without losing this pleasant effect. This smooth feeling ends when a brief quick of tart greets the back of your throat at your sips finale. This kick lightens up the feel of the drink just enough to tease your mind with a different texture. Another point in the case for more carbonation would be how heavily this sits in my stomach. I believe that if it were a bit bubblier the weight in my stomach would be lifted to the point of not being noticed. With all that said though C&C Mango is still a pleasant surprise that I would recommend to my fellow soda drinkers. Twist loves mangoes. He was legally married to one for 17 years until she left him in a fit of rage. It's a rather sensitive subject that we don't talk about much around here.